Where does the Sun set Wintertime in Nelson? Well here you go, no need to wonder anymore…. these photos were taken yesterday evening, and although not technically the shortest day of the year, as its a day later…..it will give you an idea of where the sun sets in the “middle of winter” in New Zealands sunshine capital, Nelson. 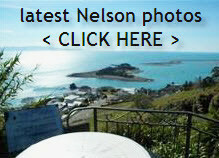 Have added a couple more photos over at Nelsonians Life too, right here. This entry was posted in Buyers, General, Nelson, photography, retirement and tagged Buyers, buying, climate, coastline, hdr-photography, Nelson, NZ, photography, Stoke, sun, sunset on June 23, 2012 by David Leggott. After holding on to my Palm Treo 650 for over 5 years (actually I’ve gone through 4 of them, 1 unfortunately met its end between the car & the car door – not a pretty sight) I’ve finally taken the plunge. Every year I’d upgrade to the latest fan-dangled unit, and although I’d try over 1-2 weeks to get the “hang of it”, each one just didn’t seem to offer what seemed to be the Treo’s ease of use and functionality. So I’d get rid of the new upgrade and find / source another T650. However Telecom are going to shutter the CDMA network soon so this time I was under a bit more pressure to upgrade to XT. So with the arrival of the Galaxy I thought I’d give it a good go this time around. Lo and behold I was surprised….its a delight to use and so far I’m loving it. I still long for the ease of use of the Treo when it comes to texting or inputting characters, but most other things work well. In light of my experience, & perhaps the shuttering of the old network it set me wondering whether there might be some other baby boomers out there going through a similar experience. With this in mind, I thought it pertinent to cobble together the most helpful apps I’m using and let you know about them…so that if you were to upgrade to an Android phone you too, could hopefully see & experience some tangible benefits. Here we go…. according the many apps sites from where you can download it…..
Click on Image above for further details. If you are a bit geographically challenged then this is a quick & simple program that does just what you think it will do. For Nelson we’re fortunate in that most locations are hemmed in, and you can practically always get a idea of a landmark somewhere, but appreciate it some really built up areas it might not be so easy. Could imagine that for an inner city apartment dweller, this would be quite a neat aid when viewing downtown apartments. Keeping in mind it’s as the “crow flies”, but you can change that and enter your own “track”…this tidy little app will do your measurements all for you. And it definitely comes in handy every day. Your intro to reading and sending tweets + photos from your phone. 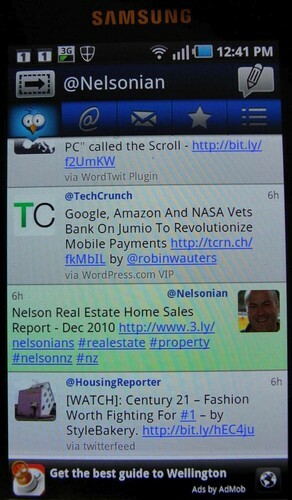 As well as this app Tweetcaster that I use, there’s also an official Twitter app and plenty of others too. 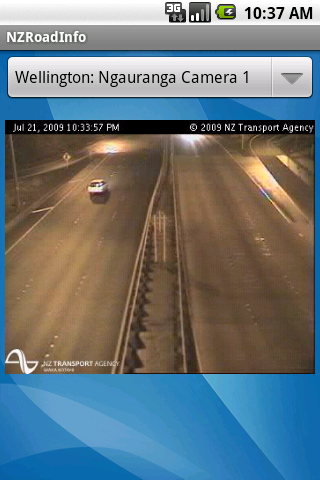 Unfortunately it doesn’t cover the whole of New Zealand at this stage, just traffic cam images from Auckland, Wellington, Christchurch and Tauranga. Still, if you live in one of these places and don’t prefer to purposely sit in the car for an unnecessary extended period, this site might just be worth a look. Helps if you are “chronologically impaired”….in a calendar type of way I mean. Very handy when you are working out unconditional and possession dates for a buyer or seller. So that you can ensure you co-incide your viewing inspection appointment with the High Tide. Not pretty because its not a graphical representation mainly just a list of numbers, but it does the job. Also assist with finding the right time of day to get fabulous listing photos of your new seaside/estuarine property. Ok, …..so its not really from the “useful” real estate agent section, but it is a fun one you must admit? 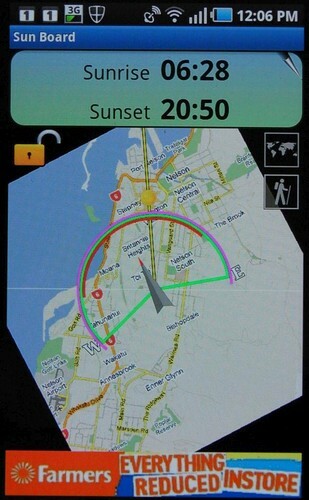 To add to this there are plenty of mortgage assessment / calculators out there, and although not in New Zealand yet, plenty of Android Apps worldwide that allow you to search for property based on your GPS estimated location…..or so called “location aware” apps. I’m aware that realestate.co.nz has an iPhone app….but with US researchers like Gartner Inc’s comment above…… forecasting increasing Android uptake, it must only be a time factor until we see an equivalent Android one. I’m sure there equivalents to these apps here in iPhoneland, however I have personally found these to all be really useful and quite relevant in day to day real estate work. One thing I have come to appreciate on this Galaxy S / I9000 is the brightness of the fancy named Super-OMOLED screen, its brilliant when trying to read the screen outdoors in the especially sunny skies we are accustomed to here in Nelson. This entry was posted in General, New Zealand, photography, Technology, Uncategorized and tagged agents, Augmented, education, google, hdr-photography, mapping, sun, Technology on January 29, 2011 by David Leggott. As regular readers well know, I have a keen interest in photography. So do in fact take pride not just in my real estate related property photos but also in what you might term “everyday” shots. Great to see Jim Hickey display my photo on tonight’s TV One News as his pic of the day. This morning on my walk I had my new phone with me, a Galaxy 9000 and it does indeed take some pretty neat photos I’ll admit. However living here….well you can take these sort of vistas for granted….but I do make an effort to try not to. I took a few others, you can see them over here at Nelson Life….along with many more photographic posts depicting Life in Nelson, in a sort of “Day in your Life” style……. 37 x photo posts this January 2011 alone. This entry was posted in General, Nelson, New Zealand, photography and tagged hdr-photography, Nelson, NZ, photography, recreation, sun on January 26, 2011 by David Leggott. Whether you are a Real Estate Salesperson or not, its not always convenient to get the best photo of a home potentially for sale. I mean….. oftentimes when you are called to pop around for a visit, its at a time when the light isn’t the best to take a photo, at least a good one. So I was quite surprised to learn that there is actually an iPhone app that will process an HDR type image – and do it all in-camera, ready for you to just upload that shot directly to the office, or immediately onto the web. Even more reasons to go mobile if you ask me. iPhone owning Real Estate Salespersons will soon have no excuse, not even for a hastily taken listing photo! This entry was posted in Nelson, photography, Technology and tagged hdr-photography, marketing, photography, Technology on August 19, 2010 by David Leggott. I’ll start with what I feel is probably the most important one, exposure. I see too many photos like this. And it just reinforces my belief that some agents do not put as much time into this crucial part of the process as they should. Does this accurately get the “bright clean sparkling white” bathroom message across? For some photos, its not hard to spot the “get this over as quick as I can” type of mode straightaway. Well the good news is, its easy. If your camera has “fill flash” or “synro flash”, enable it. Failing this take two shots, one with flash and one without. and this allows you to do all the above much easier – you go across to the window as before, aim out and fill the frame with about 70% of the outside light, then press the AE Lock button. It will now memorise the “light” settings and you don’t have to maintain that pressure on the shutter button as before. Review, or if you are lucky enough to have a histogram on the camera, really find out what they mean. These really are an indispensable aid in reviewing a photo while still on site. If you really want to be creative then spend 5-10 minutes learning about bracketing. Many of todays cameras will do this automatically. There are two main methods. One where the exposure is bracketed itself in degrees of EV. The second is where it actually brackets for different lighting conditions, and is a feature of digital cameras. And if you want to get really really creative after you have taken your 2-3-4 shots in the bracketing mode, then head on over to read my series about HDR. If in doubt as mentioned before take a shot with flash on. However with the earlier mentioned method #2 above, most modern cameras should take consideration of the outside light and even if they fire the flash inside, you will get a much more balanced “light” photo. And surely in most photos its the inside of the home that you want to be shown the best. Just to show how common the issue of exposure in photos is, all of the first 4 photographs have been uploaded to a Real Estate site in the last 48hours. If you want to see more uncollectable examples of “what not to do” in Real Estate Photography, then check this out. NOTE: All of these tips are assuming you have the camera in its normal default exposure mode, commonly refered to as either “center weighted metering” , “multi-segment metering” or “matrix metering” but definitely not “spot metering” unless you know what you are doing. This entry was posted in Buyers, General, photography, Sellers, Technology and tagged hdr-photography, photography on September 11, 2009 by David Leggott.